Allows people to translate from 54 languages to 53 other languages (~2900 combination!). Automatically scales to 109 x108(~11,800 combination). Google continuously adds support for newer languages and the Zimlet is designed to automatically include them when they become available. 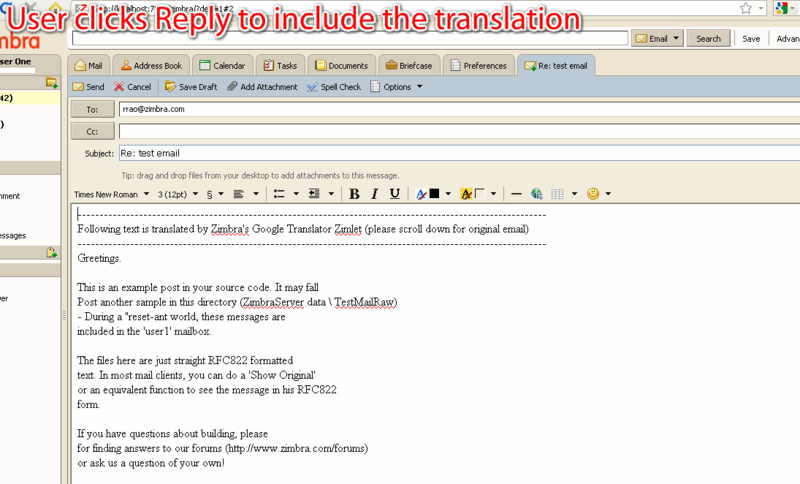 When a user gets an email in a language other than what the Zimbra is set to, they can now press "Translate" button to instantly translate it. Google's new api automatically figures out the from-language and the Zimlet automatically passes the to-language based on what is set in Zimbra's Preferences. The result of the translation swaps the email-body with new text. By pressing the Read Side-By-Side button in the Translation-toolbar, user can read both original and translated emails side-by-side!! If you change the language in these menus, they will automatically run a new translation. As long as the translation widget is active or open, reply/replyAll/Forward all automatically include(prepend) the translated text to the email being composed. PS: Version 4.0 uses Google's V2 API as Google has made this paid API starting Dec 1st. To use this, you need to specify Google API KEY. .. this will take you to their billing console. Use credit card and pay & enable Billing. PS: It looks like this API key could be used for many paid-apps (not sure). Version 3.0 is same as 2.5 + bug 49313 fix + version# fix. Version 2.5 is a total rewrite of the Zimlet and supports all languages that Google supports and more. configured as advised, but the zimlet says "Cannot translate. Ask your system administrator" . System administrator is me, so I'm asking myself, but without success. The error messages should contain more essential information about what's wrong. Placed the bug to bugzilla, no response so far. I purchased API key and deployed zimlet but it's not working and messing up all zimbra:I'm getting following error in browser console : Error: o.run is not a functionSource file: http://mx.domain.com/zimbra/js/Startup1_1_all.js.zgz?v=110928141017Line: 1158 And thins error in zimbra: Script Error: appCtxt.getViewTypeFromId is not a function - nodev_all.js:12879File: http://mx.domain.com/service/zimlet/res/Zimlets-nodev_all.js.zgz?language=en&country=US&cosId=e00428a1-0c00-11d9-836a-000d93afea2aLine: 12879Error: TypeErrorStack: ("LOADING",false)@http://mx.domain.com/service/zimlet/res/Zimlets-nodev_all.js.zgz?language=en&country=US&cosId=e00428a1-0c00-11d9-836a-000d93afea2a:12879("onShowView",[object Array])@http://mx.domain.com/zimbra/mail?adminPreAuth=1:2471("onShowView",[object Array])@http://mx.domain.com/zimbra/js/Startup1_1_all.js.zgz?v=110928141017:22847("LOADING",(void 0),false)@http://mx.domain.com/zimbra/js/Startup1_2_all.js.zgz?v=110928141017:19258("LOADING",(void 0),false)@http://mx.domain.com/zimbra/js/Startup1_2_all.js.zgz?v=110928141017:19254("LOADING")@http://mx.domain.com/zimbra/js/Startup1_2_all.js.zgz?v=110928141017:18957()@http://mx.domain.com/zimbra/js/Startup1_2_all.js.zgz?v=110928141017:19930()@http://mx.domain.com/zimbra/mail?adminPreAuth=1:668([object Array],true,[object Object],null,true)@http://mx.domain.com/zimbra/mail?adminPreAuth=1:1354([object Object],[object Object])@http://mx.domain.com/zimbra/js/Startup1_2_all.js.zgz?v=110928141017:21931("Options")@http://mx.domain.com/zimbra/js/Startup1_2_all.js.zgz?v=110928141017:20910([object Object])@http://mx.domain.com/zimbra/js/Startup1_2_all.js.zgz?v=110928141017:21395([object Object])@http://mx.domain.com/zimbra/mail?adminPreAuth=1:668([object Object])@http://mx.domain.com/zimbra/js/Startup1_1_all.js.zgz?v=110928141017:3376("SELECTION",[object Object])@http://mx.domain.com/zimbra/js/Startup1_1_all.js.zgz?v=110928141017:3202("SELECTION",[object Object])@http://mx.domain.com/zimbra/js/Startup1_1_all.js.zgz?v=110928141017:11217([object Object])@http://mx.domain.com/zimbra/js/Startup1_2_all.js.zgz?v=110928141017:11589([object Object])@http://mx.domain.com/zimbra/mail?adminPreAuth=1:668([object Object])@http://mx.domain.com/zimbra/js/Startup1_1_all.js.zgz?v=110928141017:3376("SELECTION",[object Object])@http://mx.domain.com/zimbra/js/Startup1_1_all.js.zgz?v=110928141017:3202("SELECTION",[object Object])@http://mx.domain.com/zimbra/js/Startup1_1_all.js.zgz?v=110928141017:11217([object Object])@http://mx.domain.com/zimbra/js/Startup1_1_all.js.zgz?v=110928141017:15097([object Object])@http://mx.domain.com/zimbra/js/Startup1_1_all.js.zgz?v=110928141017:15232([object Object])@http://mx.domain.com/zimbra/mail?adminPreAuth=1:668([object Object])@http://mx.domain.com/zimbra/js/Startup1_1_all.js.zgz?v=110928141017:3376("onmouseup",[object Object])@http://mx.domain.com/zimbra/js/Startup1_1_all.js.zgz?v=110928141017:3202("onmouseup",[object Object])@http://mx.domain.com/zimbra/js/Startup1_1_all.js.zgz?v=110928141017:11217([object MouseEvent],"onmouseup",[object Object],[object Object])@http://mx.domain.com/zimbra/js/Startup1_1_all.js.zgz?v=110928141017:12322([object MouseEvent],[object Object],[object Object])@http://mx.domain.com/zimbra/js/Startup1_1_all.js.zgz?v=110928141017:12238([object MouseEvent])@http://mx.domain.com/zimbra/js/Startup1_1_all.js.zgz?v=110928141017:12177 Please help. Nice but very poor integration. Can you please add English to Dutch, Dutch to English, German to Dutch, French to Dutch, Spanish to Dutch Is it possible to do this myself?Thanks. 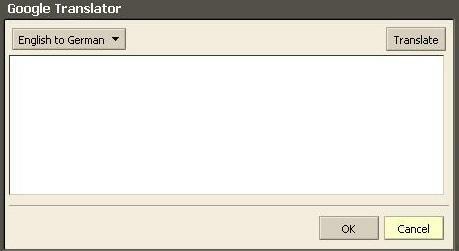 when i will be able to install this zimlets on a Zimbra ZCS 7.1.4_GA_2555 (build 20120104215751)??????? Someone please make this work again. Since google has now abandoned their translation API, this should be remade with the bing translator. http://msdn.microsoft.com/en-us/library/ff512404.aspx Please make this work again! I desperately need the functionality. As an event planning jobs, I often do co-operation with people overseas and of course different languages. for it, this tool is very helpful to me. I love this tool, it is invaluable to me. Now that Google is switching to a paid version of there API does this mean this tool is dead for good. Is it economically feasible for VMware to pay for a license to offer this tool to it's users. Or are there alternative API's out there that are just as good and are free. I have installed this and its works great. Is there any way I can install this on my website at: http://www.frynge.com I want to offer my site in many different languages. Thanks! I use the zimlet on zDesktop and it works great! But most of the time I'am working with the webclient of Zimbra Network 7.0.1 and here we have no function of the Google Translator? !Any new for an update?Thanks for your work on this. This zimlet is an excellent tool for some of our users who receive their mails from all over the world in different languages.However, this zimlet works best with web client, it's not compatible with ZD 2.0, please make it compatible with ZD. Bug 49969 is still present and latest timestamp inside the zipfile is 07-27-10. Great tool, very useful in my work. Found one minor glitch, the combo boxes do not function correctly when you are trying to change the languages. The new language you select does not get actioned and it reverts to what it had before. (You can work round it by selecting the combo box and rolling the mouse wheel to change the language). Can you add this functionality to emails you open in a new window too? Great app anyway, a real timesaver. Awesome work zimbra ... I just love this feature .. just wondering if we can click the translate button, write a word and get it translated ... besides translating the whole mail. Can you please give additional info on translation pair settings? Google does translations in more languages, that available in Zimlet. Can we do it by ourselves? Use this Zimlet to translate messages from one language to another. The Zimlet uses Google Translator to do the translation. Simply drag-and-drop a conversation or message onto the Zimlet and choose which pair of languages to translate. Then click the "Translate" button and the body of the message will get translated! You can also double-click on the Zimlet panel icon and type in your own text to translate. Version 2.0 adds support for ZCS 6.0 and i18n. Use this Zimlet to translate messages from one language to another. The Zimlet uses Google Translator to do the translation. Simply drag-and-drop a conversation or message onto the Zimlet and choose which pair of languages to translate. Then click the "Translate" button and the body of the message will get translated! You can also double-click on the Zimlet panel icon and type in your own text to translate.